Jan Wright, retired Hamburg Police Chief and Registered Yoga Teacher (RYT 200) , will be teaching the Yoga for Golfers Workshop at PEARLL Yoga for the Soul on Saturday, April 11. Image courtesy of PEARLL Yoga for the Soul. FRANKLIN BOROUGH, NJ – Spring is now in full swing and PEARLL Yoga for the Soul has classes to help those seeking to ready for the golf season and those yearning for overall relaxation, with some new programs for April. The Yoga Worship for Golfers is one on PEARLL Yoga for the Soul’s lineup, ready to get golfers in shape for their game and spring golf events. The workshop will help to teach balance control, strength and coordination. The instructor for the event is Jan Wright, retired Chief of Police of the Hamburg Police Department. Wright holds a wealth of experience in addition to his law enforcement accolades, including work as a motivational speaker, former instructor with the Navy Seal Adventure Challenge and his certification as a New Jersey Certified Firearms Instructor. As a Yoga Instructor, Wright is a Registered Yoga Teacher (RYT 200) and brings yoga to underserved populations through the non-profit group, Yoga Impact, for which he is the Program Director. 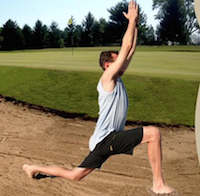 Yoga for Golfers has limited space and reservations are required. It takes place at PEARLL Yoga for the Soul’s studio on 91 Main Street in Franklin on Saturday, April 11, from 11 a.m. to 1 p.m. All skill levels are welcome and the program cost is $40 per person. Call (973) 271-0015 to register. Beginning on Thursday, April 2, is the five-week Introduction to Yoga Series, for students brand new to the art of yoga. The series will cover: Yoga’s history, poses, pranayama (breathing), mudras (“hand yoga”) and guided meditation. Class size is limited to eight students, with pre-registration recommended. The five-week series runs Thursdays from 6:30p.m. until 8:00 p.m., and is $55 per student. The days classes will take place include: April 2, April 16, April 30, May 7 and May 21. Email: pearllyoga@gmail.com for reservations. Click here to learn about PEARLL Yoga for the Soul, which has a mission to help within the community and a portion of every proceed benefits DASI (Domestic Abuse and Sexual Assault Intervention Services) and the Marine Corps League Detachment 747. Click here for PEARLL Yoga for the Soul’s full class schedule. Editor’s Note: PEARLL Yoga for the Soul is an advertiser on NJInsideScene.com. For advertising information, contact: jennifer@jjavenueproductions.com. Interested in more of our stories? Click here to follow us on Facebook.